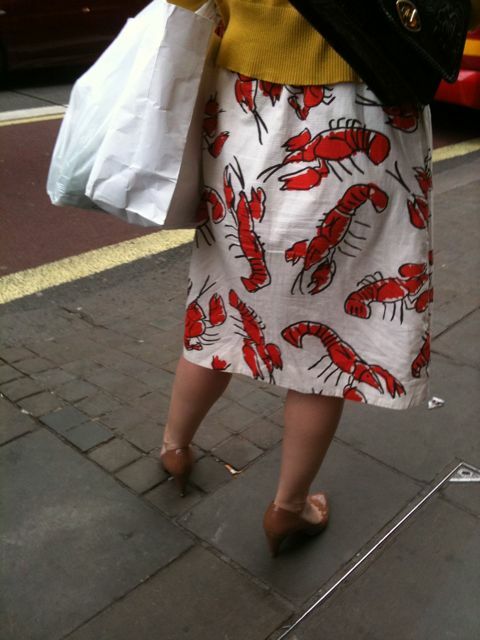 Sorry girl, but that lobster dress was too good not to share. I’m guessing it’s vintage but the cut actually looked pretty modern so… anyone got any ideas? PS Sorry for no posts, it’s been a long, long birthday weekend complete with blood, guts and lots of rock and roll. Well, that was easy. My dear pal Kristina just informed me the dress is from Anthropologie. Makes sense I guess, me and the woman in question were both getting the bus outside the store armed with bags from within… the only thing that doesn’t make sense is that she then spent the entire bus journey talking about not being able to pay her rent. Don’t buy a dress that costs £118? Nah, I’ve been there. It’s always worth getting the dress. Rent can always wait. Next question: is it worth me waiting for Vegas to buy it for a little less or should I just spaff the bday cash? Previous Post Weeki Wachee mermaids come to London! Kristina! You are amazing. The weird thing is, we both had Anthro bags and were both getting the bus from outside the Regent St store… Amazing, ty!